History of Ireland is a new show for 4 women (and a sack of potatoes) using theatre, comedy and dance. Dressed in traditional Irish dance costume and wigs, 4 ‘ex-Irish dance champions’ will treat you to a taste of Ireland. From the Druids to Michael Flatley’s mother, Moxie Brawl take a look at the stereotypical view of Ireland from leprechauns and Guinness to folklore and myths and attempt to re-write the history of Ireland by highlighting Irish women’s achievements often forgotten in history books, such as their role during the Civil War and winning the right to vote, along with legends such as Queen Maeve of Connach, Biddy Early and B*Witched! We will also talk about the struggles Irish women faced in the laundries and how in 2016, abortion is still illegal. It will be loud, thoughtful, fun, slightly crazy and very green. The show has already gained support from The Place’s Choreodrome 2015 and was shortlisted for the NRTF Dance Initiative. In Calm Down Dear, Moxie Brawl are presenting a first draft of a research and development, which will be a result of two weeks in the studio at The Place. 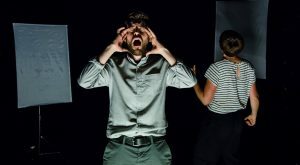 With a strong visual language, they want to tell stories that are fun yet challenge stereotypes whilst keeping the piece technically light and use props and costumes to enrich the narrative and connect with audiences. The show will be created in Spring 2017 to premiere and tour beyond. Moxie Brawl is a fresh all female inclusive dance theatre company that makes work for outdoors, indoors and places where dance shouldn’t be. They are co-produced by Candoco Dance Company and are winners of the Gi20 Jury prize 2013 and nominated for 2 Brighton Fringe awards in 2016. 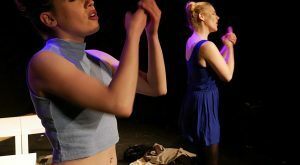 Director Sarah Blanc won a Brighton Fringe Award in 2016 with her solo show It Started With Jason Donovan.